Om shanti, shalom, salaam, peace, peace, peace. We love that quote. 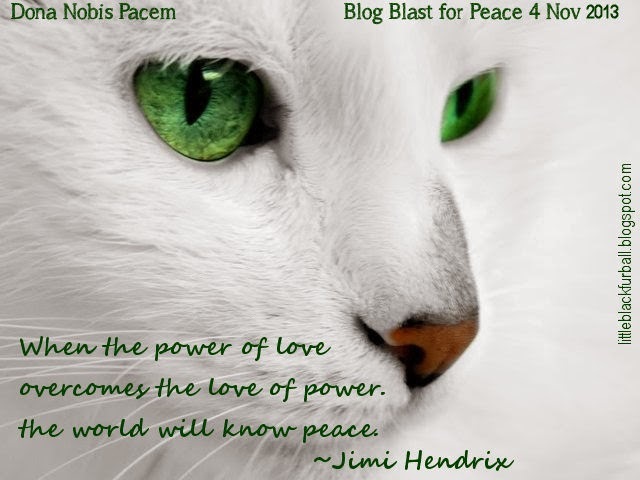 We purr for peace. Cats may argue from time to time, they know that the best way to live happily is to be at peace... Purrin' for Peace right along with you! Peace and power cannot be easy friends. Only injecting the power into peace can we find some sense of status quo. Kitties know all about peace. Beautiful and quiet. Strong and wise. What an outstanding peace globe, Buddah Pest. Thank you for inspiring us.